War Command gave Aidan O'Brien a belated first two-year-old Group One triumph of the season when lifting the Dubai Dewhurst Stakes at Newmarket. However, it was a workmanlike rather than an impressive victory for the Coventry and Futurity Stakes winner, who had to show his battling qualities to get home in front. War Command, the 10-11 favourite, was hard ridden by Joseph O'Brien to hold 20-1 shot Cable Bay by a length and a quarter, with Outstrip third and Anjaal fourth. The winning jockey told Channel 4 Racing: "The ground was plenty slow for him. When he got to the front he was idling like mad. He was waiting for a horse to come to him, but did enough. I think he's getting more professional with each race. "He's definitely a Guineas type. I think he will have no trouble getting a mile and I think the faster the ground, the better he will be." O'Brien senior added: "I'm delighted with the horse as I was very worried about the ground. He's a good-actioned horse and when it was very quick at Ascot, that was what he wanted. "There is only one Dewhurst and we had to get him out. I'd say he's done for the year now and I think he'll get a mile next season." Cable Bay's trainer Charlie Hills said: "He ran another great race and he's been very consistent. How he hasn't won a Group race, I don't know. We've been beaten just over a length by a good horse and hopefully he can keep progressing next year." Charlie Appleby, responsible for the third home, Outstrip, said: "We're a bit disappointed as he didn't pick up like he did at Doncaster. Maybe it's just the year getting to him now. 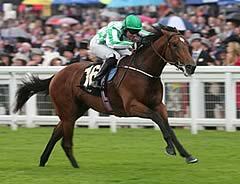 I think we'll put him away and if he can furnish and develop, hopefully we can see him as a Guineas horse."